I am a believer in reading nutrition labels with everything that I eat. I want to know what I am eating, how many calories, and all of the information I can get. I won’t lie, when it comes to nuts, I try to stay clear. Not only are they high in fat, but you only get a small handful for around 200 calories. Think of the things you could eat for 200 calories that are much larger in size? Almonds— They are packed with vitamins, minerals, proteins, and fibers that are needed for a healthy diet. Just one serving of almonds equals 1/8 of the amount of protein you need each day. Almonds do contain a high level of unsaturated fat, but as you would have read in previous blogs, unsaturated fat is HEALTHY (in moderation of course)! Also, eating a handful of almonds a day is a great way to get the vitamin E your body needs to stay healthy. That was enough proof for me to believe that they were good for me. I also found that snacking on almonds kept me more full than other snacks I choose. Looking for more reasons why almonds are HEALTHY and AMAZING? Check out What are the health benefits of almonds?. Pistachios— My favorite part is cracking them! I only go for the salted ones, but I can handle a little extra salt in my diet because I have low blood pressure (Blood Pressure). Jessica Bruso, holder of a science degree in food policy and applied nutrition, states “Pistachios contain fewer calories and more potassium and vitamin K per serving than other nuts.” (Health Benefits of Pistachios) She also researched and found “A 1-ounce serving of dry-roasted pistachios contains 160 calories, 6 grams of protein, 3 grams of fiber and 15 grams of fat, including only 2 grams of saturated fat.” The biggest thing with pistachios is limiting your portions. In reality, that is with all foods! Pistachios are my personal favorite so over-eating them does happen. One trick I like to do is measure out a serving and put them in separate bags. That way, when I want a snack, I can finish the whole bag and know that it was one serving. Pecans— They are enriched with many health benefiting nutrients, vitamins, and minerals that are essential every day. Pecans are also great source of energy. According to Power In Your Diet, Pecans “are rich in monounsaturated fatty acids like oleic acid and an excellent source of phenolic antioxidants. Regular addition of pecan nuts in the diet helps to decrease total as well as LDL or “bad cholesterol” and increases HDL or “good cholesterol” levels in the blood.” Does this mean you should load up on the pecan pie? Probably not, but adding a hand full of pecan nuts every day in your diet will help keep sufficient levels of minerals, vitamins, and protein. Be smart, and snack on! Walnuts— If you can handle cracking the shell open, then do it! Walnuts are not only delicious, but the soft, easy-to-chew texture makes it one of the world’s favorite nuts. 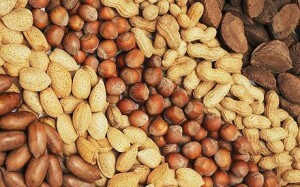 They are very rich in Vitamin E and also help reduce the risk of prostate cancer and breast cancer. (Walnut Benefits) Walnuts are also very high in fat. In 1 cup there is about 52 grams of fat but only 4.2 grams of that is saturated fat. (The Walnut) That is still a lot of fat, but remember, everything is good in moderation. Peanuts— The most common nut out there due to the cheap price. Peanuts are more readily-available and cheaper to grow which is why they are so cheap. According to Nutrition and You, “Peanuts are an excellent source of resveratrol, another polyphenolic antioxidant. Resveratrol has been found to have protective function against cancers, heart disease, degenerative nerve disease, Alzheimer’s disease, and viral/fungal infections.” (Facts of Peanuts) One thing that makes a peanut odd is that it is referred to as a legume, not a nut. (Peanut) They also contain more saturated fat so be careful when consuming and make sure you only eat one serving. Nuts taste great and can also be great for you. When you see high calorie food labels with such small portions, don’t avoid them. Check out the nutrition facts and ingredients and usually you will be able to detect why. I can honestly say that now, Almonds are my absolute favorite snack! Something that I have always struggled with is eating a healthy lunch. Mostly because I am always on the go and finding time to make a healthy lunch to bring to work or class can be very time consuming. And trying to find somewhere quick to stop and eat healthy can be almost impossible. So decided I’d do some research of my own and figure out, if I have to, where to go out to eat and what to get. In case you didn’t have time the night before, or whatever the case is, Subway is one of the healthiest “fast food” chains that most people will have in driving distance of where they work, without spending a fortune. Now the trick is to order the right sub, with the right toppings and dressings. And last but not least we have condiments. This is a tricky one because the best condiment is no condiment. I’ve seen plenty of times when someone ahead of me has a very promisingly, healthy looking sub and steps up to the last station and says “a bunch of mayo”. There is more fat in a single serving of mayo than in a lot of subs! So be careful when it comes to this. Vinegar has no nutritional values and helps the taste of subs by making it not so dry. Well to recap, in order to want to eat at Subway and be healthy about it, you have to restrict your options to certain choices. Watch the sodium intake. There is a large amount of sodium found in a lot of restaurants like Subway, so remember to keep that in mind in order to keep a balanced diet. Condiments: the biggest danger of all. Make sure to really know how many calories and grams of fat each one has before making your next visit to Subway. Skip the soda and get a free cup of water. There are empty calories and sugar in soda that can be easily avoid for free! Actually you will save money by saving your health. Skip the chips and get a bag of apples. After all, an apple a day keeps the doctor away. If you are interested in seeing the nutrition facts on your favorite subs or other choices at Subway, you can find all of that information here. Summer, a time where you not only get three months of (almost) worry free bliss and warm weather, but a time where some of your favorite fruits and veggies are in season. For me personally, summer calls for eating more whole foods because I have more time on my hands to prepare and cut up fruits and veggies and discover new recipes with fresh produce. Plus, I think it’s safe to say that we all love a good slice of watermelon or some delicious strawberries on a summer day. We love fruit during the hot weather because it’s refreshing and healthy, what could be wrong with fruit? It is natural after all. However, have you ever found yourself in the midst of indulging in a slice of watermelon wondering why there are no seeds in it? …Probably not, since a lot of us think of seedless watermelon to be more convenient because who wants those annoying little black seeds in the way of you going to watermeltown? 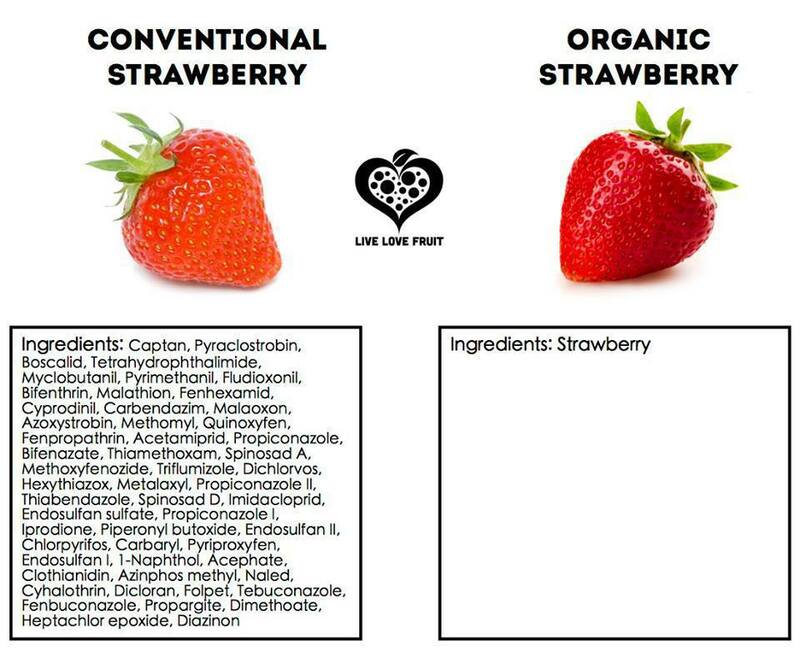 But the unfortunate truth is that a lot of our beloved fruits and veggies that we assume are totally fresh and natural may have been genetically modified and/or have been raised using conventional methods to fertilize and control weeds. Terrifying I know, so what is the solution to this you ask? Organic and GMO free products! Now, what qualifies as organic? Organic means that agricultural product such as fruits, veggies, grains, dairy products and meat has been grown or raised without using conventional methods. Instead, organic farming practices use natural fertilizers to feed soil and plants with crop rotation or mulch to manage weeds. What is GMO? GMO means genetically modified organism, for instance, seedless watermelon. The label “organic” usually means GMO free but unfortunately not all of the time! 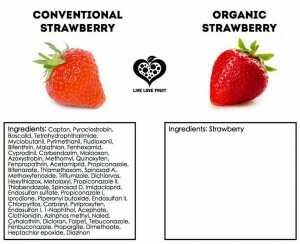 Since there are loop holes, produce can be genetically modified and considered “organic”. So keep an eye out for the GMO certification as well as organic! What are conventional methods and why are they bad? As far as conventional methods go there are a few different types that come with their own con’s and risks. First off, there is the use of chemical and synthetic pesticides or fertilizers, which is harmful to the environment and to us. These chemicals contain neurotoxins which are damaging to brain and nerve cells. Not only are they used within conventional methods but eighteen percent of genetically modified seeds are engineered to produce their own pesticides. Even worse, studies show that these seeds may continue to produce pesticides after you’ve eaten the food that grows from them. I don’t know about you, but eating food that manufactures it’s own pesticide inside of you is not my cup of tea. Another conventional method is the use of antibiotics which are used to speed growth and fatten up animals in the meat and poultry industries. These are only a couple of the methods used on conventional farms, you can check out more methods such as mono-cropping and genetic-engineering and modification and details about them here. What are the benefits of organic food? A common misconception of the idea of organic food is that it is a guarantee that it is healthier. But it really depends on what type of food you are banking on to be deemed as healthier. For example: unfortunately, your organic potato chips still aren’t going to be your healthiest pick at the grocery store. However, just because the label “organic” doesn’t mean unnatural products like chips are healthy, it does mean that any whole foods that are natural are increased in nutritional value if they are organic. According to care2.com research shows that organic food is higher in nutrients, and in vitamin C, antioxidants, and the minerals calcium, iron, chromium, and magnesium. So if you’re talking organic produce oppose to factory made groceries, you go ahead and get down with your organic eatin’-bad self because there are many health benefits that come along with organic eating. Some may be skeptical about the idea of organic eating. Due to inconvenience and the price ect. Going about your life constantly asking and checking if a certain food is organic is a concept that makes some people cringe due to it seeming to be a huge hassle. But you do not have to go to the extreme of being one hundred percent organic in order to receive the benefits that come with organic eating. Simply incorporating more organic food into your life will be a positive impact to your health. When it comes to expenses, organic food is making it’s way into more stores and restaurants therefore making it more common, accessible, and affordable. So next time you see the word organic labeled on a food product, think about what it means and the benefits that come with it. Being knowledgeable about conventionally raised produce will help you avoid enduring the negative effects that come with it. So switch up you summer fruit feasts and make it organic, and eat clean to feel healthy! 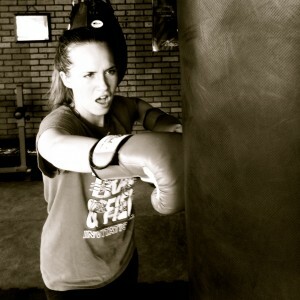 When I think of kickboxing I tend to think of tough, ripped, really intense people who spend all day punching bags. It is a sport that I’ve always been interested in, but being the yoga lovin’-paddle boarding-runner that I am, I’ve never considered myself that “tough,” therefore I’ve been too chicken to try it. After seeing my friend promote her kickboxing class on social media for a few weeks, I decided to give up my sissy ways and take the plunge. My first thought when I started the class was, “woah.” Half way through the class my thoughts progressed to, “WOAH,” and when the class was over, my body was too tired to even process thinking. I knew kickboxing was intense, but I never imagined it being THAT intense. It was awesome. Stations 1 and 2 consist of “STRENGTH BUILDING”. You will use Dumb Bells, Kettle Bells, Medicine Balls, Jump Ropes, and other equipment to build strength and stamina. Stations 3-8 are where the real FUN begins. You will strike a variety of bags including 100lb Heavy Bags to build power, double end bags to increase hand eye coordination and timing, and speed bags to develop shoulder conditioning and speed. Although the workout is short, my friend and kickboxing trainer Brittany assured me, “The stations incorporate different kickboxing and boxing techniques through circuit training, strength training, aerobic and anaerobic exercises.” She also went on to saying that on average you burn anywhere between 300-500 calories. Not bad for 30 minutes! And I believe it too, because after that time I was feeling the burn. I personally found the whole experience very transforming. It gave me the chance to feel tough and powerful, and not like a weak duckling for once. This is something that I would recommend to ANYONE who has ever had the urge to try kickboxing. Although intimidating at first, at 9Round they have personal trainers guiding and pushing you the whole way. On top of that, your first class is free! The 9Round gyms are located in Oak Creek, Brookfield, Madison East and Madison West, but if you have your eyes on another kickboxing gym go check it out! It doesn’t hurt to just try it, and believe me, if I can do it, you can do it. I was afraid to try it and now I can’t wait to go back! Good luck! To check out more information about kickboxing or prices to the 9Round gym, please feel free to visit their website!